Since 2009 Paulette Phillips has engaged the art world in an examination of truth and lying through her project The Directed Lie. Ambitious and international in scope, The Directed Lie is a living archive of performance based video, drawings sculpture and text-based works. We lie to get what we want, we lie to protect people we love, we lie to maintain a sense that we are trustworthy and honest. Everyone lies; representation itself is a lie. We lie to navigate tricky social interactions. We accept that lying is okay and yet the idea of lying goes against our moral and ethical codes of behaviour. Paulette Phillips is interested in this slippery moral behaviour and intrigued that through this process the body belies the authority of language, as the subject speaks, the body denies. The body betrays the mind; through actions that subsequently require lying to cover up and through tremors that belie denial. In each test the subject is asked to answer 33 questions while attached to a polygraph. The instrument produces mechanical ink drawings that indicate ‘a knowledge’ that resides in the body through the measurement of blood pressure, heart rate, and electricity. From the ink drawings, tiny coloured lines of visualized data, irregularities in these lines can be interpreted as ‘responses’ – heightened subconscious activity in the subject’s body. 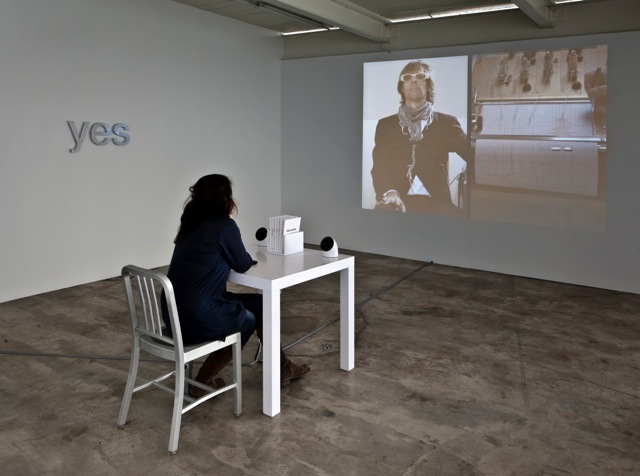 As an installation the viewer gets to watch this process, both the activity of the machine and the concentrated, vulnerable face and body of the interviewee, accompanied by the artist’s voice asking the questions. The polygraph translates the body’s autonomic nervous system, an uncontrollable response, and renders the response as an ink drawing. Paulette Phillips works with ideas related to looking, cinematic language and behaviour. She has established an international reputation for her tense, humorous and uncanny explorations of the contradictory forces that play out in our construction of stability and certainty. Concurrently her work As Could Be (2009) is showing in the No Longer Empty exhibition in Queens NYC and The Directed Lie (2009- ongoing) in About the Mind at the McMaster Art Gallery, Hamilton. Her work is in public and private collections in France, England, Canada and the US including The Museum of Modern Art, New York; The National Gallery of Canada; Frac, Haute-Normandie, Caen, France. She teaches contemporary art practices at OCAD University in Toronto.